Atletico Mineiro right-back Emerson will link up with the Catalan side in July. Emerson joins from Atletico Mineiro. 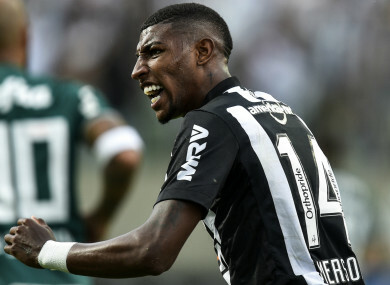 BARCELONA HAVE REACHED an agreement to sign Atletico Mineiro defender Emerson for €12million. The 20-year-old will join Barca on 1 July and has agreed a five-year deal running until the end of the 2023-24 season. In the meantime, he will acclimatise to La Liga with a loan stint at Real Betis for the remainder of this term. Emerson is currently representing Brazil in the South American U20 Championship in Chile and Barcelona compared his style to that of Dani Alves in their statement to announce the deal. It is believed Barca sporting director Eric Abidal went to watch him in action against Gremio on 3 November during a scouting trip to South America. La Liga’s champions have been active in the transfer market this month, sealing a deal to bring in highly rated Ajax midfielder Frenkie De Jong from 2019-20 and bringing in Kevin-Prince Boateng on loan from Sassuolo to provide attacking cover and Jeison Murillo from Valencia to bolster the defence. B-team product Munir El Haddadi joined Sevilla on a permanent basis, while Denis Suarez moved to Arsenal on loan after signing a one-year contract extension. Barcelona have brought forward their summer move for Jean-Clair Todibo and will sign the defender from Toulouse immediately, the Spanish club announced on Thursday. Todibo had been due to join Barca on a free transfer in July, when his contract with Toulouse was set to expire. The 19-year-old, however, has since been sidelined by the French club, prompting Barcelona to seek an earlier transfer. AFP Sport understands a fee of around 2 million euros was agreed for the France underage international, who has already played 10 times in Ligue 1 this season. Email “Barcelona strike €12 million deal for Brazilian full-back”. Feedback on “Barcelona strike €12 million deal for Brazilian full-back”.